Our local agricultural lenders offer flexible rates and terms along with a consultative approach. At Mid Penn Bank, we’re committed to supporting hard-working farmers in counties across the state of Pennsylvania. 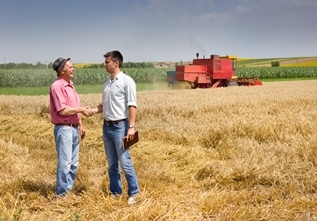 Working with an agricultural lender in Pennsylvania can help ensure you have the local financial support to complement your agricultural knowledge and skills — regardless of the market conditions. Our local leadership knows the agricultural world and is prepared to work alongside you to aid in your success. With attractive rates and flexible repayment terms, Mid Penn Bank offers services that match the realities of owning an agricultural or farming business. Whether it’s a conversation about today’s challenges or your long-term vision, we’ll take the time to understand your needs. Contact Senior Agricultural Lender Stan Michonski at 717-743-3802, Senior Agricultural Lender Jeff Myers at 717-920-9075 or Agricultural Loan Officer Jeff Stanko at 717-985-7093 to learn more.